Lisa Lake/Getty Images for Geisinger SymposiumFormer Secretary of State Hillary Clinton. During a speech at Rutgers University on Thursday, Clinton argued that Republican politicians are being forced to the far right by wealthy donors with their own agenda. 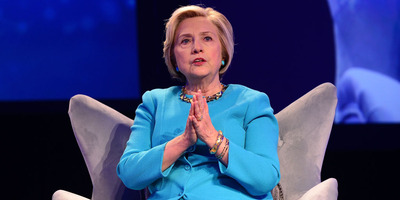 Talking about the divisiveness in politics, the former Democratic presidential nominee said both Democrats and Republicans are responsible for the country’s political rift. But, Clinton argued, the Republican Party is being pushed rightward by a group of powerful, hard-right donors seeking to promote their own agenda. She praised Sen. John McCain, the Arizona Republican and former presidential candidate who’s been an outspoken critic of the president and his administration. Diagnosed with brain cancer last year, McCain has been recovering at home in Arizona for the last several months.